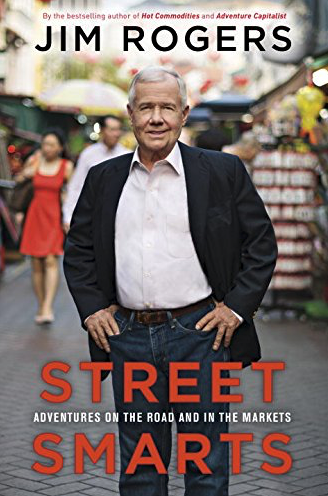 Jim Rogers was a guest on the Futures Radio Show podcast and you can listen to the full interview here: "Investing in the Real World – Jim Rogers"
Tourism is going to be great. Korea has not been on the tourist map. If people are sitting around in Europe thinking about where am I gonna go in Asia, I think of Japan, China, Bali, they don't think of Korea for historic reasons. But now people are going to start thinking about going to Korea. 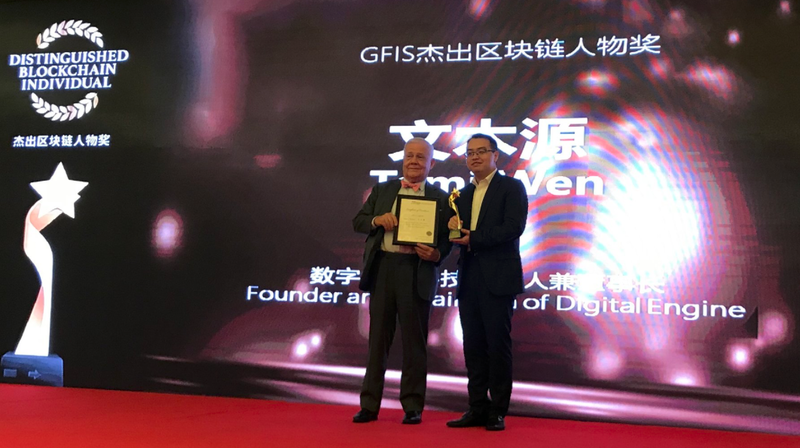 CEO Christoph Boschan and Jim Rogers, who jointly invented Quantum Funds together with George Soros in the early 1970s and became a national capital market hero when we woke up the Vienna Stock Exchange in 1985, in a spontaneous interview. 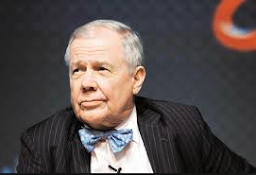 Watch the video interview here, Wiener Börse Insights - Talk with Jim Rogers. Jim Rogers talks to Anthony Crudele on the Futures Radio Show. Topics discussed: trade selection process, risk management and position sizing, asset bubbles and yield curves. Right now, I'm buying a Russian stock for instance and that's exactly what I've been doing. I've been putting in limit orders for several weeks, it's not that active (stock). I consider myself an investor where I buy things and I try to own them for years, preferably forever. That's my success, if I've had any. The way I do it: I find something that's cheap, usually if nobody's paying attention and if it's ignored it's cheap. But if you can find something that's cheap where there's positive change taking place, often you make a lot of money. So, that's my way of doing it. You're Gonna Be Successful In Your Own Madness! You're not gonna be successful doing what your parents or your teachers or your friends tell you to. You're gonna be successful in your own madness. That's how people become successful. They do something they love, they don't listen to other people. Q: Let's back to the future now because we're in the middle of this electric car revolution that's creating a major shift in demand and supply in commodities for things like Lithium and Cobalt. So, is that kind of thematic investment that you're looking at and how is the best way to play it? A: Well, yes the problem with those two that you mentioned are that there's no public market. You know, there's plenty of futures in Zinc and Copper but there's not futures in Lithium and Cobalt. So you have to be in the mines or buy the stuff itself which is not so easy for most people, including me. I had an interest in a company which had lithium mines but at the moment I have nothing. "Stock Market: The Trump Put"
"The Real Reason Why The Fed Cannot Raise Rates"
"The Coming Recession Will Be Bearish For Bonds"
Soon Korea will be the most exciting country in the world. More exciting than China, more exciting than the United Kingdom, more exciting than any country you can think of. They have lots of cheap, disciplined labor in the North, they have lots of natural resources in the north, they are right on the Chinese border. You put it together with South Korean capital, South Korean expertise, South Korea market size... It's going to be a country of 80 million people on the Chinese border with cheap labor and lots of natural resources. If you can find very cheap and positive change you're probably going to be successful. So there's positive change taking place in North Korea. I try to exercise every day try to go to the gym every day there's no question about that I can't always do it because of traveler or conflicts or something else but that I try to do and I tried not to I try to avoid things that don't interest me. "I have not found a way (to invest in Blockchain), a small enough company, (an) independent company where I can invest in blockchain." The Internet is changing us all it will continue to change it so broad what's it called blockchain any blockchain is going to change everything we know it's gonna put a lot of people out of work a lot of people out of business. "There German cities that are gonna go bankrupt in the foreseeable future." 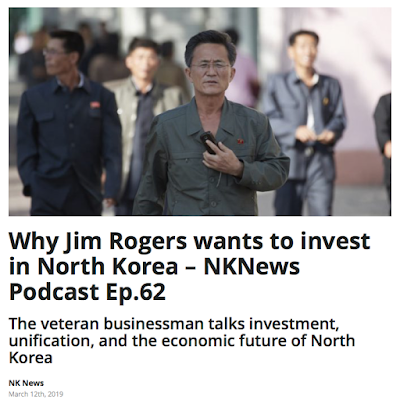 Listen to the latest Jim Rogers podcast with NK News, "Why Jim Rogers wants to invest in North Korea – NKNews Podcast Ep.62". Jim discusses the prospects for an unified Korea, investments and the economic future of North Korea. Jim Rogers' wife talks about their trip around the world, their globe collection and their home decoration with pictures and objects from a ll around the world. The digital coins are all going to go to zero and disappear. Blockchain and crypto currencies are two entirely different things as you well know. Blockchain is going to change everything we know, it has a phenomenal future. Electricity changed everything we know and put a lot of people out of business. Blockchain is going to put a lot of people out of business too but it's great for the world. But crypto currencies are all gonna go to zero, they're all going to disappear. Would you rather live in North Korea or Switzerland? I can tell you would prefer to live in Switzerland then North Korea. They don't want to live in North Korea too. They want to live like they live in South Korea. This is not 1989 this is 2019 they know and they don't want to live that way anymore. Chairman Kim grew up in Switzerland so he doesn't want to live in North Korea. If you were Chairman Kim would you rather live in North Korea or Switzerland? He wants to live in Switzerland so he's changing it. I have read about and have seen the changes that are taking place. So, the peninsula is going to be a very, very exciting place. It's illegal me to invest in North Korea so no, I haven't. I'm trying to find investments in North Korea but so far I have invested in Korean Air but that's not a great way but it's difficult to find things. Would you rather live in North Korea or Switzerland? I can tell you would prefer to live in Switzerland then North Korea. They don't want to live in North Korea too. They want to live like they live in South Korea. This is not 1989 this is 2019 they know and they don't want to live that way anymore. Chairman Kim grew up in Switzerland so he doesn't want to live in North Korea. If you were Chairman Kim would you rather live in North Korea or Switzerland? He wants to live in Switzerland so he's changing it. I have read about and have seen the changes that are taking place. So, the peninsula is going to be a very, very exciting place. Jim Rogers talks about the unification of North Korea and South Korea plus ways to invest and benefit from that process. The digital coins are all going to go to zero and disappear. Blockchain and crypto currencies are two entirely different things as you well know. Blockchain is going to change everything we know, it has a phenomenal future. Electricity changed everything we know and put a lot of people out of business. Blockchain is going to put a lot of people out of business too but it's great for the world. But crypto currencies are all gonna go to zero, they're all going to disappear. 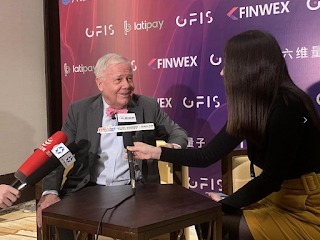 Jim Rogers unfazed by summit collapse, says NK still attractiveJim Rogers recently spoke with The Korean Times and expressed that is still is very optimistic on a unified Korea in a relatively short period of time. Read the complete article here: "Jim Rogers unfazed by summit collapse, says North Korea still attractive"
I'm trying to get more and more involved with Korea because I know what's going to be very exciting I'm looking for investment they will benefit from the future opening of Korea the unification of Korea. Of course it's a delay but it's something that's inevitable, it's going to happen. It's just a delay, you know, life is full of delays and mistakes and problems. It's not the first time I've seen delays and problems. We're gonna have an open and unified Korea. The Koreans have been here for 5,000 years. The Americans have been here for 70 years. Don't worry, it's going to happen. North Korea wants it, South Korea wants it, China wants it, Russia wants it. It's going to happen! It's a bump in the road it's a delay, it should be happening right now. Now we have to go through all sorts of delays and changes and discussions and talk and waste of time but it's going to happen. Yes, there are central banks buying gold but whether do we like it or not you know gold has been around for a few thousand years and many people like it. Academics can say that gold is meaningless, gold is, you know, all the things that some academics say about gold but like it or not you cannot tell a French peasant that he shouldn't buy gold you cannot tell me that I shouldn't buy gold. So, like it or not people for historic reasons, emotional reasons, insane reasons for whatever reason there are many people who know or think they know that in a crisis gold and silver are the places to be. So it's not going to end, not in my lifetime anyway, not in your lifetime. Gold has been around a few thousand years and it will continue to be around. Yes, there will be people who will sell it at times. There are a lot more French peasants than there are intellectuals from Ivy League universities and when I say French peasants I mean common people all over the world. Focus of course is extremely important and everybody who is successful is focused. I would add or maybe substitute the word focus with persistence. Persistence may be the same thing as focus in this case. We all know smart people that are not successful, we all know educated people that are not successful, we all know beautiful people that are not successful and we all know talented people that are not successful. The ones who are successful are the ones who never give up. So, you don't have to be educated in order to be successful. You don't even have to be beautiful if you persist or if you focus. Jim is about to launch a new book, “The Future of Japan and the World That Will Be Read Through the Flow of Money.” and we will be sharing a few of the best reviews from his earlier works. "I learned that everything is connected. I learned that a revolution in Chile was going to affect the price of copper, and thus the price of electricity and the price for houses-the price of everything- all over the world, having an impact on everyone, including Toledo. I learned, also, that if you could figure out that a revolution in Chile was coming, you could earn a pretty good living". "You have to stay ahead of events. The action is never ending. It is like a four-dimensional puzzle, linked to volume and time. Every day you come to work and find that they have moved the pieces on you-somebody dies, there is a strike or a war, weather conditions have shifted. Things change, no matter what. Investing lacks the rhtym of other endeavors, and therefore never stops testing you." "Study of History and Philosophy were indispensable to me as an investor." "The conventional wisdom that existed at the start of each decade was shattered over the following decade". "If History teaches us nothing else, it teaches us this: what appears undisputed today will look very different tomorrow." Jim Rogers gave a recent interview to The Japan Times where he commented the current state of the markets including on how a trade deal between the United States and China could cause a temporary, non-lasting euphoria in the stock market. 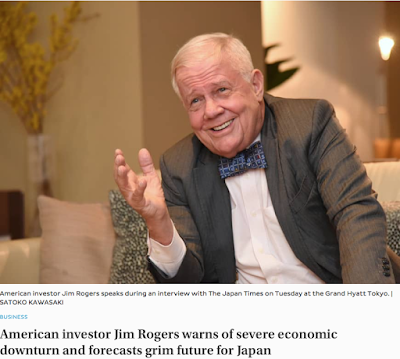 You can read the complete article here: "American investor Jim Rogers warns of severe economic downturn and forecasts grim future for Japan"
Rising interest rates going to be the main problem and they're going to be serious but the trade war... Nobody's ever won a trade war and trade wars have never been good for anybody. So, that could be another problem and all of these things coming together. When you have bear markets everything goes wrong. When we are in a bull market everything goes right, bad news comes out and everybody says "Don't worry, we can solve this! "and stocks go up. In bear markets, bad news starts coming out and people say "Oh my gosh! Guess what just happened" and then something else happens and it gets worse and worse. That's the way bear markets are. They're not fun but that's the way they are. The Federal Reserve after 2008 started printing money like never before in world history. Interest rates went to the lowest in world history and in some places they even went negative as other central banks followed America's central bank. The Fed's balance sheet alone increased by 500% and this all happened in 10 years. It's astonishing historically that this could ever happen if we were talking 20 years ago, 50 years ago or 100 years ago. If we said this would happen people would not have believed, they could not comprehend it because that's not what central banks and responsible people have ever done. So the American central bank went nuts did something which has never been done we're all gonna pay the price. The debts keeps running higher and higher and now they're backing down again. The longer they wait to correct the situation the worst it is going to be in the end. It is slowing, fortunately fortunately for China and fortunately for the world. When anything goes straight up without a pause is going to have a huge crash someday. The situation, the way I read it, well, you know what's happening with Trump, you know what's happening with the trade war and things of that sort. But also China has built up a lot of debt in the last decade or so and the government is now insisting, demanding and forcing people to start reducing their debt. When you go from adding debt to reducing debt, you're obviously going to have a slowdown. That's my assessment but I'm sure there are other things going on as well. Paper money is going to disappear and it's going to be on the internet but this is going to be government money it's not going to be anybody else's money. Money is already disappearing in China and in many countries. China's far ahead of the United States for instance. While I'm extremely optimistic about blockchain and I'm extremely optimistic about the changes of money to the internet which I know is happening it's not going to be crypto currencies because the government's are not going to let it happen. Blockchain and crypto currencies are two entirely different things as you well know. Blockchain is going to change everything we know, it has a phenomenal future. Electricity changed everything we know and put a lot of people out of business. Blockchain is going to put a lot of people out of business too but it's great for the world. But crypto currencies are all gonna go to zero, they're all going to disappear. Anybody who thinks these interest rates are high needs to go back and do a little history because these interest rates are the lowest in recorded American history. I mean we never had interest rates this low, this long (the last four or five years). So these are anything but high interest rates on a historic basis. That's true everywhere in the world. Interest rates were negative in some countries in the world. Japan has never had such low interest rates, much of the world has never ever had such low interest rates. So, if you think these interest rates are high please do some homework. In periods of slow inflation people don't notice it so much. But when inflation starts rising rapidly then people notice it and they take action with their investments and other things as well. Certainly when inflation is here and coming back and getting stronger, interest interest rates are going to go higher because people have to be paid more on their money when inflation is here because the money's losing value every day. People want to compensate for that with higher interest rates. As far as I'm concerned it's another case where it's India is going deeper and deeper into debt. I know politicians try to buy as many votes as they can and mr. Moody's doing a very good job of preparing for the next election. I don't consider it good for India, I don't consider it good for the world and it certainly doesn't make India more attractive to me and perhaps not to other investors either. There are structural problems, they have all these rules and laws and regulations supposedly to protect the farmers. They make farming worse, it's more difficult to be a farmer in India than many other countries. Peter Schiff gives a fantastic explanation of the current state of the stock market and how the Federal Reserve has made an 180 degree on monetary policy when the stock markets crashed in the forth quarter of 2018. This is madness. Trade wars have never been good for anybody. Nobody has ever won a trade war. Unfortunately, Donald Trump does not know history or if he knows history, he thinks he is smarter than history. He thinks, "I can win a trade war!". He does not know what he is doing, you should be worried. If you are not worried, read some more and you will get worried! In periods of slow inflation people don't notice it so much. But when inflation starts rising rapidly then people notice it and they take action with their investments and other things as well. But certainly when inflation is here and coming back and getting stronger, interest interest rates are going to go higher because people have to be paid more on their money when inflation is here because the money's losing value every day. People want to compensate for that with higher interest rates. I realized when I first came to China in the eighties that China would be the next great country in the world and I used to tell people to teach their children Mandarin. Both of my daughters are fluent in Mandarin. The little one is just now in a Chinese movie as a matter of fact. 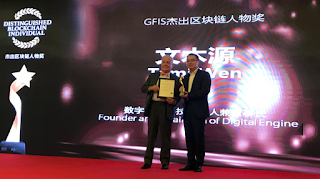 Tomi Wen (Huobi China CEO) have been awarded the "Distinguished Blockchain Individual" at Global Fintech Innovation Summit and the award was handed out by Jim Rogers. In 2008 China had huge amounts of money saved for a rainy day. It started raining and they started spending the money and helped save the world. But now even China has debt. China has a lot of debt so in the next time around you gonna see Chinese companies with debt to deal with. The good news is Beijing has said they are going to let them go bankrupt. I hope they mean it. In America we don't let people go bankrupt but in China they say they are going to let people go bankrupt. I hope so. It will be a shock to a lot of people including me and I just told you it's going to happen. You are going to see bankruptcies in China because they have a lot of debt now. The digital economy is going to change dramatically everything we think we know. My children will never go to a bank, a post office, a doctor and things we don’t even know about. It’s going to be exciting, I hope we get it right. 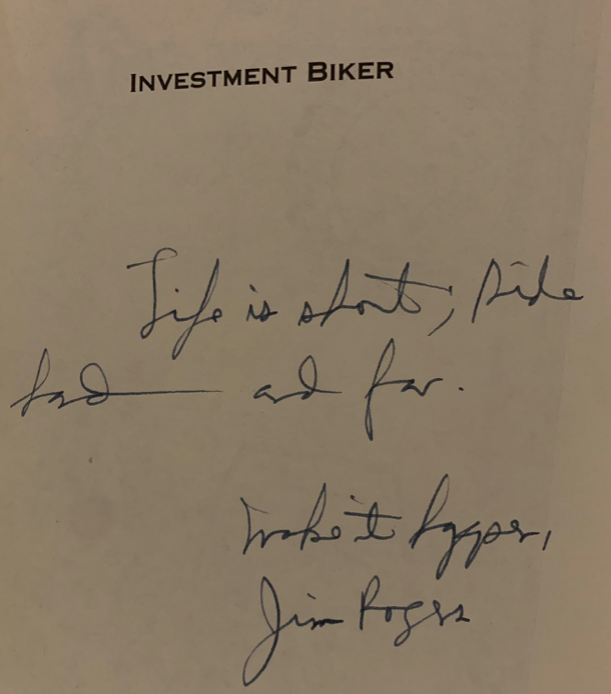 Here's the second part of the best investing one-liners from Jim Rogers in 2018, sorted by topic. "Historically when there's a huge short position in anything it goes up." "First of all, we have a central bank which has no clue what it's been doing and probably also not what it will do in the future." "When things go wrong they're gonna make more mistakes." "Certainly nobody wants to be a communist and if they want to be a socialist, they want to be a rich socialist." "No communist nation or a communist country has ever succeeded." 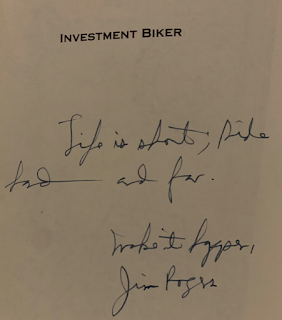 Here's a collection of the best investing one-liners from Jim Rogers in 2018 by topic. Trump, in his brain, thinks he can win a trade war and that a trade war is good for him. Nobody's ever won a trade war, history is very clear about the effects of trade wars. Crude oil is in the process of making a complicated bottom. It will go higher because reserves are declining everywhere in the world except fracking but that bubble the fracking bubble broke. Sugar, believe it or not, is down something like 80% from its all-time high. The highest rate of suicide in the UK is in agriculture. Exciting things are happening in Venezuela right now. Korea is probably going to be the most exciting country in the world once North Korea opens which will and very soon. Historically when there's a huge short position in anything it goes up. Only invest in what you, yourself know a lot about. Those who can not adjust to change will be swept aside by it. Those who recognize change and react accordingly will benefit. If anybody laughs at your idea, view it as a sign of potential success!